Continuing in my list of Twelve Moments of Anime 2009, we come to one of the hottest topics of the summer. 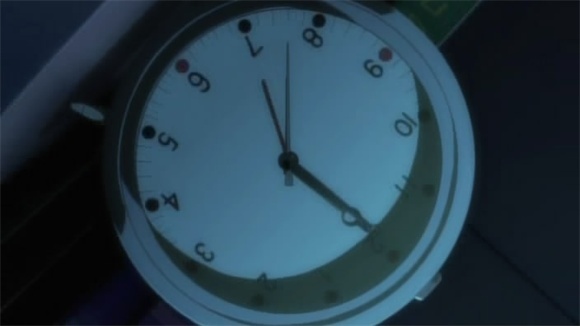 For eight weeks, Endless Eight was the subject of disbelief, bemusement, and rage. Some said it was a troll from Kadokawa and KyoAni. Others decried it as the worst betrayal in recent memory. A few defended it in one way or another. Viewers dropped the series entirely; some vowed to return after the plot moved on. Haruhi‘s MAL rating plummeted. I, for one, loved it (though I hated the ending—see below). And while ghostlightning enjoyed each new episode by considering it a rewatching of the old, I enjoyed all of the episodes for themselves. Part of this, I admit, was the schadenfreude of watching the people who couldn’t stand it grow increasingly irate. But I really do think that Endless Eight was a triumph, and not a troll. From the beginning, Haruhi has always played fast and loose with what we expect in an anime series. The first season was broadcast totally out of order, for (in my opinion) the better; I still maintain this is the best order to watch the first season in the first time, since it’s much better paced than watching those episodes in continuity order. KyoAni was brave and brash enough to deviate from the norm, and it worked out. Because of the release format of the second season, a similar stunt wasn’t possible (though I really wish we had Haruhi ordering numbers for the 14 new episodes), so they did something else unexpected, something that no one in their right mind would ever attempt. I agree, Endless Eight would be a travesty if they had re-aired the same episode totally unchanged for eight weeks in a row. But Kyoto Animation went to the effort of reanimating, redirecting, and rerecording Endless Eight anew for each trip through the time loop. That made Endless Eight more than just a troll of its viewers, and gave it meaning. 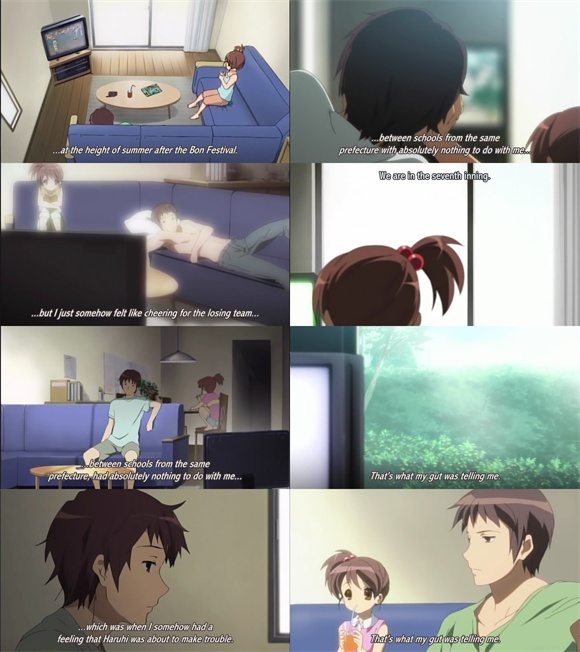 By reanimating the same story, the same dialogue, the same events, and the same characters, KyoAni and Kadokawa transformed Endless Eight into a control of sorts; by keeping everything else the same, they accented the subtle changes in directing and animation present all the time and displayed them prominently. Even though everything is the same between these eight episodes, everything is also different. The characters wear different clothes, the camera angles move, the pacing differs, the backgrounds morph, and even the episode title changes. Scenes are lit and shot differently, and some get emphasized while others are downplayed or omitted entirely. And each episode seems to have a different theme, a unique focus in its animation and direction. Episode 2, the first Endless Eight episode, simply sets up the plot and events. But through the subsequent episodes we see things from different viewpoints and with different emphases. The second time through, Episode 3, features overbrightened lighting and slightly washed out and blurry scenes, as if the whole thing is just a dream. In Episode 8, the 7th trip through the loop, the colors fade almost to grayscale whenever Kyon feels the overwhelming familiarity of a scene. And my personal favorite, Episode 6, shows the fifth journey through August focusing on Kyon’s environment and surroundings (and whose animation and direction reminds me of SHAFT). Each episode in Endless Eight is subtly different, but within that difference lies meaning. This isn't SHAFT, though you might have fooled me. But beyond meaning, I think dragging Endless Eight out was the correct choice from a story perspective. I can’t see how the arc could have anything near the same amount with only two or even three or four episodes. Let’s break this down; one episode is needed to introduce the events of the summer, a second to introduce the time loop. Ending the loop in the same episode as introducing it makes the loop just another plot device, so we need a third episode to end the arc and give the time loop time to become real, instead of being something only referenced in the dialogue. At a bare minimum, it doesn’t make sense for Endless Eight to be shorter than three episodes; but that still loses something very important. Endless Eight is about frustration and an inability to act; at the end of every episode, Kyon reaches out in desperation, hoping that somehow, somehow, he can find a way to break the loop and allow time to move forward. By repeating Endless Eight over and over, we gain a very visceral and personal understanding of Kyon’s emotional state, as we too wonder how to break the loop and escape. That feeling of reality is something that’s impossible to convey in any other manner, and I think it’s a piece of genius, making it an (endless) Moment #8. I hate the last episode of Endless Eight. Why? Because Kyon gets lucky. I think it’s pretty obvious that Haruhi doesn’t want to do homework with the others; she wants Kyon to ask her out on a summer date, the last stereotypical high school summer break activity she hasn’t covered (they never go to a theme park, after all). Itsuki knows it; that’s why he tells Kyon to whisper “I love you” into Haruhi’s ear, and why he says that it wouldn’t be the same if he did it. Kyon is too dense or cowardly to take the obvious way out, so he uses his homework as an excuse, which seems to satisfy Haruhi enough (it gives her an excuse to spend the day at Kyon’s house partying, which is almost as good). But I never felt like this half-answer to the time loop deserved the epic buildup it got, and I can’t help feeling disappointed in the ending as a result.